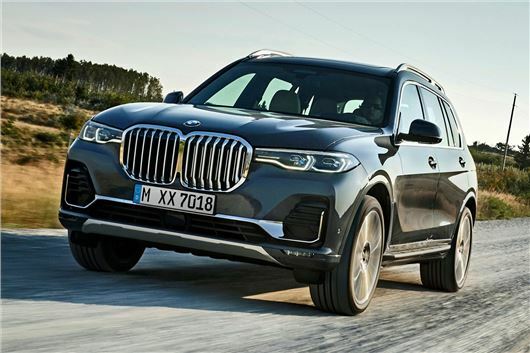 This is the biggest BMW ever built and it's set to tackle the Range Rover and Mercedes-Benz GLS when it's launched in the UK next year, with prices starting at £72,155. The X7's massive dimensions (it's more than five metres long and two metres wide) mean there's enough room for seven full-sized adults inside. If you don't need to carry so many bodies, you can opt for two individual seats in the second row offering the same amount of comfort and functionality as the front seats. Ordinarily, the X7's boot holds 326 litres with all seats left up. This increases to a van-like 2120 litres with the rear two rows of seats dropped. A huge opening panoramic glass sunroof is fitted to all models as standard, while buyers can opt for a 'Panorama glass roof Sky Lounge' with LED lighting intended to be reminiscent of a starlit sky. The flagship BMW will initially be available with a choice of one petrol and two diesel engines. That £72,155 start price will get you an xDrive30d with a 265PS six-cylinder diesel engine, capable of hitting 62mph in 7.0 seconds flat and returning a claimed 43.5mpg. Next up is the petrol xDrive40i, starting at £74,155 and capable of returning 32.5mpg.Topping the range is the M50d, which uses a six-cylinder diesel producing 400PS and a mammoth 760Nm of torque to hit 62mph in 5.4 seconds. Prices for the M50d start at £87,240. All engines are paired with an eight-speed Steptronic automatic transmission and xDrive all-wheel drive, capable of transferring all of the power to the rear wheels when four-wheel drive isn't required. As standard, the X7 features air suspension that can be lowered at the touch of a button for loading the boot. An extra 40mm of ground clearance can be provided when required, should you ever venture off road. The BMW X7 goes on sale in the UK from April 2019.